Most sectors of the capital markets in the EU have shrunk relative to the size of the economy over the past decade – and the gap in the depth of capital markets with the US has widened. This report highlights the urgent need for action to boost capital markets in the EU – particularly after Brexit – but also shows that there is a huge growth opportunity for capital markets in Europe. When it comes to the financial markets, the debate around Brexit has generated more heat than light over the past few years. We thought it would useful to put some actual numbers on the size of depth of different sectors of the capital markets in individual countries across the EU to help frame what Brexit means when it comes to the future relationship between the UK and EU, the future of the capital markets union initiative, and the future financing of the European economy. 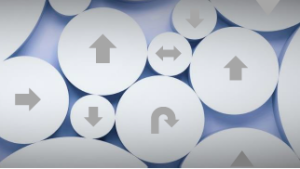 The report analyses 24 sectors of the capital markets – from pensions and asset management to corporate bond markets and venture capital – over the past decade in Europe and at an individual country level. It’s the third year that we have run this analysis and it makes for sobering reading: capital markets in the EU are on average smaller and less developed relative to GDP than they were a decade ago; the gap in depth between Europe and the US has widened; and our analysis of the size and depth of capital markets in the EU27 underlines the urgency of the capital markets union initiative. It highlight the need to reduce the EU27’s reliance on bank lending, diversify sources of funding for companies, and develop deeper pools of long-term capital in the EU27 post-Brexit. On the plus side, corporate bond markets have grown rapidly over the past decade; there has been a clear shift from bank lending to markets; pools of long-term capital in Europe are growing; and in the past few years there have been encouraging signs of progress in equity markets. The report also highlights and quantifies the enormous growth potential of capital markets in the EU and EU27. 1) Still in recovery: Capital markets in the EU have still not recovered from the financial crisis: at a time when companies in the EU need access to a wider range of funding more than ever, capital markets are on average smaller and less developed relative to GDP than they were a decade ago, despite some encouraging growth in recent years. One third of the sectors in our sample have shrunk in absolute terms over the past decade and two thirds of sectors have shrunk relative to GDP. 2) A transatlantic divide: Capital markets in the EU are only around one third as deep as in the US, and this transatlantic gap in depth has widened over the past decade in two thirds of the sectors in our sample. While capital markets in the US have grown relative to GDP over the past decade, they have shrunk in 80% of EU member states. 3) A post-Brexit divide: Brexit has highlighted the urgency of developing deeper capital markets in the EU27. 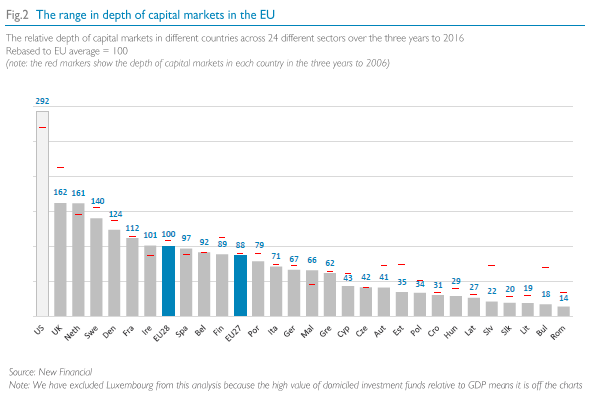 On average, capital markets in the rest of the EU are only half as deep relative to GDP as in the UK. This gap in depth has widened over the past decade in more than half of the sectors in our sample. 4) A wide range: There is a wide range in the depth of capital markets across the EU. A handful of countries such as the UK, the Netherlands and Sweden, have highly developed capital markets, while the depth of markets in big economies such as Germany and Italy is only two thirds of the EU average, and capital markets in Central and Eastern Europe are one third as deep. 5) A decline in bank lending: The value of bank lending to companies in the EU has fallen by more than a fifth in real terms from its peak, and the flow of new bank lending in the eurozone to companies has halved in real terms. The overall value of available funding from banks and markets as a percentage of GDP has fallen over the past decade in the UK, EU, and EU27 (while it has risen in the US). 6) Long-term capital: Pools of long-term capital – the starting point for healthy capital markets – are underdeveloped in the EU and EU27. Pensions assets in the EU are just one quarter as large relative to GDP as in the US (and pensions in the EU27 are less than one fifth as deep as in the US). However, the value of pensions and insurance assets in the EU has grown by more than half over the past decade. 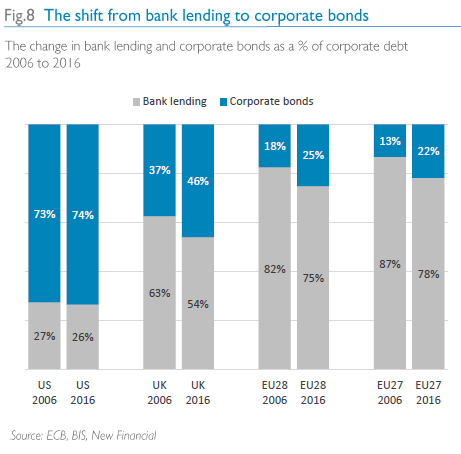 7) A shift from banks to markets: There has been a clear shift over the past decade in corporate funding from bank lending to bond markets both in the EU27 and the EU as a whole, but there is still a long way to go. High-yield bond issuance has more than tripled in the EU over the past decade and investment grade issuance has more than doubled. This may raise questions about the amount of debt companies have taken on. 8) Struggling equities: While growth in equity markets has been slower, there are encouraging signs of progress in the past few years: for example, the depth of EU stockmarkets relative to GDP has increased by a fifth over the past five years and the value of IPOs has tripled relative to GDP. 9) The growth opportunity (a): The potential for growth is huge. We estimate that if capital markets in the EU were to close half the gap in depth with the US, it would mean an additional €6 trillion in long-term capital that could be put to work in the EU economy, and around €200bn in additional equity and bond market funding each year. 10) The growth opportunity (b): If capital markets in the EU27 were as deep relative to GDP as in the EU28 as a whole, it would unlock around €2 trillion in long-term capital and around €40bn a year in additional capital markets funding for companies. Thank you to Dealogic, for providing much of the data in this report; Panagiotis Asimakopoulos for doing most of the heavy-lifting on the research; and our members for their invaluable support for our work in making the case for bigger and better capital markets.